The yoga teacher training program that I am in is winding down. Only 2 more weeks left until I am a fully certified yoga instructor! Well, that is if I get all my hours in. The program is 200 hours and you must fulfill a certain number of hours in several different categories. Alas, even though I've pretty much dedicated the last 6 months of my life to the study of yoga, I am STILL short on hours! One category I'm short on is Community Teaching. We are required to teach at least 10 hours of yoga classes in the community for those who are underserved with healthful exercise. I currently have 6. Don't get me wrong, I've been teaching this whole time but mostly to friends, other teacher trainees, yoga parties, and random people in my building. The problem lies is finding a place to volunteer. 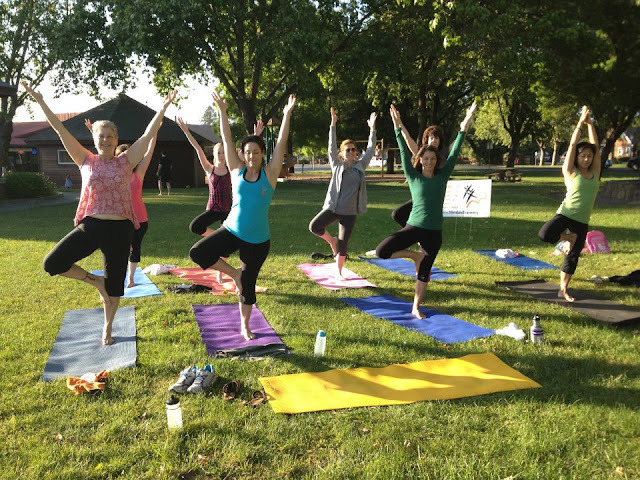 Who wouldn't want a FREE yoga class delivered directly to them?! Answer: apparently most people. If you recall, I was volunteering with a community group for middle schoolers and that went great... for approximately 5 weeks. It took soooo long for the organizers to get back to me (and get my background check cleared) that the semester was almost over by the time I started! That AND one day I showed up at the normal time to teach and group leader told me that the kids didn't feel like doing yoga so I should come back a different day. So I returned at the specified date and time and NO ONE WAS THERE. I'm still a little bitter about this. Upon realizing school would end before I accumulated enough hours, one month ago I lined up another community teaching opportunity... at my old job! I formerly worked as an Ecologist for the county government (i.e. desk job) and there are definitely folks there who don't have access to yoga in their otherwise busy lives. Dear bureaucracy, I hate you. Now I'm feeling DESPERATE! I posted on my facebook status begging people to let me teach at their jobs or community groups. I have over 500 FB friends so somebody has got to take me up on my offer, right? right?!?!?! Just think... this you be YOU!